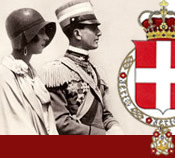 Exhibition "Princess Marie-José between Belgium and Italy, a royal wardrobe". "Jewellery of the House of Savoy". October 2011 - Chicago, USA. The Italian Cultural Institute, in collaboration with the Milan Committee of the Chicago Sister Cities, invited H.R.H. Princess Maria Gabriella of Savoy to present the book: "Jewellery of the House of Savoy". Summer 2011 - Castello d Aglié, Turin. "Historical figures of the House of Savoy". Lecture by H.R.H. the Princess Maria Gabriella of Savoy: The splendours of a royal marriage - the wedding of the Princess of Belgium. Series of lectures entitled "Eight Weddings and a Funeral". Société des Arts, Fine Arts Class. Exhibition "The trousseau of the Queen of May - Marie-José of Savoy"
Thanks to the scenographer of the exhibition, the renowned couturier Mr. Hubert de Givenchy, the Mona Bismarck Foundation had on show, for the first time in France, an exhibition of ceremonial court mantles and gowns – part of the Queen's trousseau, or wedding chest. When Queen Marie-José left Italy in the wake of the 1946 referendum, several trunks travelled with her. Inside them one of her attendants had carefully packed a collection of gowns and mantles which, over the previous sixteen years, had accompanied the Princess of Piedmont on her official duties. Sixty years later they are still in perfect condition. Exhibition "Manti Regali a Corte"
Galleria Grande della Reggia di Venaria Reale in Torino. This exhibition provided an overview of court dresses of Queen Marie-José of Italy from 1930 to 1940. The Queen had an exuberant and unconventional character. In this exhibition, visitors could recognise her flair for wearing a resolutely modern style within the traditions of the court.